I love pasta in many guises, but when it comes to ultimate Comfort Pasta, there is nothing that compares to a spaghetti bolognese. By spaghetti bolognese, I mean spaghetti topped with a rich, ground-meat and tomato based sauce. No fancy ragu or such. I don't think it's that authentically Italian, but I don't really care. It's one of my favorite cool-weather dinners. Once upon a time, I had what I thought was a perfect recipe for spaghetti bolognese. Then, about a year ago I lost my way. After a year of bewilderingly off-target bolognese, I've found my way back. I blame Heston Blumenthal for messing with my head. (Disclaimer: I am otherwise a big fan of Mr. Blumenthal.) Last year, he tackled spaghetti bolognese on his In Search of Perfection television series (and in the book of course), and came up with a "perfect" version. The perfect Blumenthal version of spaghetti bolognese is, naturally, extremely complicated, but compared to the other "perfect" versions of various popular dishes it seemed to be the most doable. So, we (note the plural: it required a team effort) tackled it, piece by piece. It does help in life to have an almost equally food-obsessive partner for such quests. It took us 3 full days to accomplish, starting from the pre-ordering of the meaty oxtails at the butcher counter (it's not a commonly used cut here), finding the perfect spaghetti, ripe tomatoes in December (yes, I know) and the final slow cooking of the sauce. And the result? It was good, yes, but perfect? Neither of us was sure. But yet it had flashes of something great in there; the meatiness of the gelatinous oxtail, the unctuous richness. So, we embarked on a long journey of trying to tweak that recipe. We tried different meat combinations. (Turkey is a definite no.) We experimented with bacon, chorizo, various sausages, salami. We tried less or more of the vegetables, canned tomatoes alone or fresh alone. All were interesting, but I still felt off kilter. Then, the other day I made bolognese more or the way I had made it for years until the Blumenthal experiments - and, it was just about perfect. Mind you, it's probably because my criteria for a perfect bolognese are different from the great chef's, as I explain below. And some of the ideas gleaned from the Blumenthal version and the ensuing experiments did creep in, making the sauce even better. In any case, I'm now happy that this is my Perfect Spaghetti Bolognese. I can now move on to perfecting other things. I prefer my bolognese to have a rich, deep taste of tomato, wine, and meat. I also like the meat to be ground quite finely so that you get an integrated 'meat sauce', rather than 'bits of meat suspended in a sauce'. The experiments with cured meats convinced me that I don't like cured-meat flavor or smoke flavor in the sauce, but a little bacon is added for richness. I like the sauce to be rich, but not swimming in fat (a pronounced feature of the Blumenthal version). It's key to let the sauce cook for a very long time - minimum 3 hours after the preparatory stage - in a thick-walled pan, ideally a Le Creuset or similar. The Heston Blumenthal bolognese is described in great detail in his first book, but also appears on this page. There's another one on The Times web site, which is quite different. Mixing fresh and canned tomato is a great idea, as is adding some cream - though I used butter instead, for that dairy unctuousness. Long cooking, of course, is a good thing, though his version takes 9 hours. The oxtail meat idea was interesting, but obtaining and then cutting the meat off the fiddly bones is way, way too much work - and ultimately, I felt, not quite worth it. It's also quite expensive here in Switzerland. For the gelatinous quality I use some veal in the meat mixture instead. His version was too sweet for me for some reason. I also didn't like the star anise addition at all - this may have added to that sweet flavor somehow. I do like adding star anise to many meat dishes, especially pork, just not this one. There was also too much added fat overall, which cause a very substantial oil slick to appear on the surface of the sauce. I've always used red wine in bolognese, and he used an 'oaky Chardonnay'. I prefer the robust red wine. Have all of the meats (except the bacon, which you'll chop yourself) twice ground by the butcher, or grind it yourself (use a grinder or a food processor) until fairly fine but not a paste. If using a food processor, it helps to cube the meat and then half-freeze the cubes first. You can buy already ground meat if you prefer, but it should be not too lean as well. Recommended to have: a food processor. Heat up the olive oil in the heavy pot over medium heat. Toss in all the chopped up vegetables, then lower the heat to about midway between low and medium. Sauté the vegetables over the low heat, stirring occasionally, until it's limp and very lightly tan. In a large frying pan, sauté the ground meats until browned, and add it all into the pot. Deglaze (add a bit of the stock or water to the hot pan, scrape off the bits ) the frying pan and add that to the pot too. At the end of the cooking process, take out the bay leaves, stir in the butter, and add salt and pepper to taste. This makes a lot of very rich sauce. About 1/2 cup is enough I think for a plate of dinner-portion spaghetti (allowing about 100g or 3 1/2 ounces dry weight per person). Portion and freeze the rest - it freezes beautifully. To enhance the flavor, toss the freshly cooked spaghetti with a knob of butter prior to ladling on the sauce. Optionally top with freshly grated Parmesano Reggiano, or Grana Padano. The only thing to serve with this is a green salad with a sharp vinegarette. You can also 'stretch' the sauce by taking a cupful and adding 1 small can (400g - about 8 oz) of crushed canned tomatoes. Adjust the salt and pepper. Sometimes I prefer this less-rich version. Or, you can add one cupful to 1 cup of cream...for a very rich creamy sauce indeed. Adding some sauteed mushrooms enhances it too. The sauce as-is is perfect for layering in lasagna, stuffing cannellini and such, paired with a perfect Bechamel. Don't ruin it by covering it with pre-powdered cardboard 'parmesan'. If there's one thing I've learned while living in Switerland it's that mystery cheese products taste really, really bad compared to the real thing. 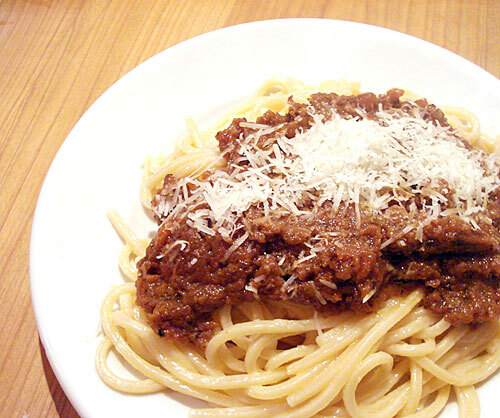 Finally, in case you are wondering, spaghetti bolognese (also known as 'spaghetti meat sauce') is very popular in Japan. 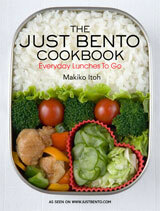 It has to be one of the most universally loved dishes in the world, no? Submitted by maki on 2007-10-25 22:00. Sounds good, but I urge you (plural- including your tempted readers) to try (again) some "lesser" cuts of meat. While I've never used tails, I have made tomato sauces and stews with neck bones, "soup" bones, etc.- whatever is marked at a low price and has a lot of bone and cartilage and tendony stuff as well as the meat. I brown these very well, let them cook whole in the sauce until the meat is easily shreddable by hand, and then add the shredded meat back to the sauce to finish cooking. The texture from all of the gelatinous bits melting into the sauce is spectacularly rich-feeling ( is there a japanese word for the mouth-feel that one gets from this type of preparation?) without needing to add butter or cream, and the flavor and texture of meat cooked on the bone is notably different from that of ground meat, though my descriptive vocabulary is failing me at the moment. I also believe that the process of handling the meat and removing it from the bones and recognizing all of the other structures that are part of the animal being cooked is important because it encourages a rather contemplative state regarding my interaction with that animal. I recently cooked beef tongue for the first time (long story involving the (peculiarly Midwestern?) meat raffle) (and for people who like darker meats with a more gamy/livery flavor, tongue would be excellently suited to this preparation, as it requires lengthy cooking and pairs well with the lingering acidity of tomato). The process of preparing the tongue led me to thoughts that bore a marked resemblance to the thankful prayers required by my childhood religion upon consumption of meat, but in this case I was not thanking a deity for providing that meat but rather contemplating the life of that cow. It was an odd, disconcerting contemplation, one that is not encouraged by Western urban styles of meat consumption,but it did not detract from my enjoyment of the food. I believe the Japanese word you're searching for is Umami. Very thoughtful comment Rebecca - thank you! Highly appreciated post, Maki. I'm a huge fan of Spaghetti Bolognese for the same reasons as you. When it's cold and I'm tired, that's what I fancy. I have a question, should you want to use cream in the recipe, at which point do you add it in the recipe? It's just that I've tasted spaghetti bolognese at one of the restaurants in KL and I think they add cream to the mixture because the taste is rich, slightly creamy and different from my version the spaghetti bolognese. P/S : I LOVE your blog. There's so much love for food here! "^_^"
Hi Sara, you'd add the cream at the very end and just heat it through (if you let it boil it would curdle). Sorry I left that out! Thanks! I have a sudden craving for spaghetti bolognese now. Will make some when I get back home. I'll probably try out your recipe later. Many thanks for putting up the recipe, I tried it last week with a couple of unexpected alterations, my butcher didn't have any veal so I got 250g of extra chop meat. I also found at the last minute I was out of Nutmeg. Everything else went to plan then I had friends round for dinner and it was hailed a massive success! One confession is that whilst nodoby actually asked where I got the recipe I also neglected to tell them it wasn't mine! Thanks again whilst at first i though this was an expensive dish after buying all the ingredients i swiftly rearlised it serves 6 -7 people! Never will i go back to Tesco mince. The japanese word your looking for is Umai. It is a sensual felling one gets from the gelatinous qualitys of meat that is melting from the bone. I am only 15 but have re-created your recipe with stunning results, i applaud your creativity in making this dish and I would like to thank you with sincere gratitude and the humble honouring of my kitchen. Your spaghetti Bolognese has been an up lifting sensation that will entice my pallet every time it is consumed. A great post. Bolognese is a favourite of my wifes and I've had it countless times over the last 25 years or so. She used to make a fairly complicated version but has simplified over the years to something very similar to yours. A few years back she changed how she makes it slightly and the little change makes a subtle yet noticable difference. What she does is... When the pasta is almost cooked she takes one or two large cooking spoons worth (about 1/4 cup each) of the salted pasta water and stirs it into the sauce. Leaving the sauce to simmer until the pasta is cooked helps incorporate the flavour and starch in the water. When the pasta is cooked and drained she takes a few of those spoon fulls of sauce and mixes with the pasta. She uses enough sauce that each strand of pasta has a light coating of the oil from the sauce on it. It's the same idea as your butter but it seems to harmonize the sauce and pasta. So glad I stumbled upon your blog. Hi - I have been making spaghetti bolognese for a long time (also my mums recipe) but am always looking for ways to improve on the recipe. i have a question about adding bacon - I dont eat pork products and am wondering if anyone has used anything else that would give a similar taste or depth?? You can try adding something like finely cut up beef salami or similar dried sausage. I like to use slightly different herbs: parsley, basil, and sweet marjoram. Not thyme, oregano, or garlic. These seem Mediterranean but not specifically Italian to me, though perhaps I am wrong. Rosemary, carrot, wine, bay leaf, and nutmeg are OK though. And of course, butter. Otherwise I my recipe is much the same as yrs. Well, garlic and oregano are ingredients widely used in the traditional Italian cuisine, as well as basil (according to my own experience, you don't really get the taste of Italy until you eat a fresh mozzarella and tomato salad with fresh picked basil, red wine vinegar and olive oil). Your recipe sounds great, I have to try it out, because the one I use is actually my grand mother's adaptation (born form the time pasta came to Spain, back in the 60s, and the shoptenders told the general people how to cook the new ingredients). The real bolognese recipe, contains garlic, pepper and bay leaves or basil: period. no oregano, thyme, nutmeg and - certainly not - rosmary. It may be necessary add a teaspoon of sugar to contrast the tomato acidness. Just curiosity, but you have tried a real bolognese recipe e decided that you like it better your way? I really get shivers down my spine when I read that as soon as foreigns put in oregano in any italian food >_< I surely don't utomatically add ketchup in any american recipe or soy sauce in the japanese ones. I like "just hungry" very much and I would have expected on an accurate food blog like yours a little more research on the subject. By the way I loved your mais soup recipe. it'really delicious! I also say above, "I don’t think it’s that authentically Italian, but I don’t really care." don't I? Adding star anise also is not 'authentic' but that is what a great chef like Heston Blumenthal adds to his version. Are you going to shudder at him too? And who is to say the corn soup you liked so much is 'authentic'? Unless I say it is traditional or authentic, this here site is about food that I like and tastes good to ME. Don't like that? Go away. Hmm I make a mean pasta sauce using turkey. Not minced but diced. 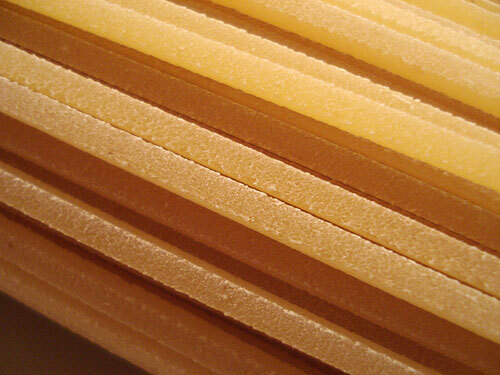 Thanks, I loved seeing the close-up of the chitarra type of pasta. This is completely new to me. That looks pretty good Maki. 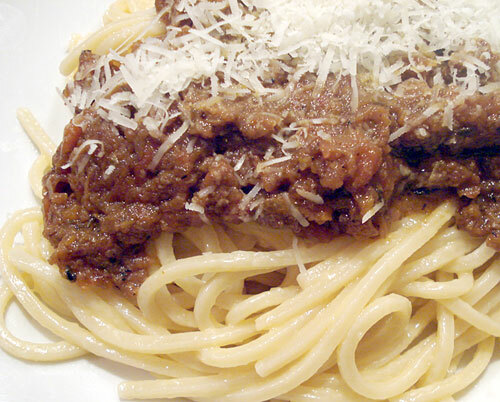 I have to agree that a good rich slow-cooked bolognese is one of the best comfort foods out there. 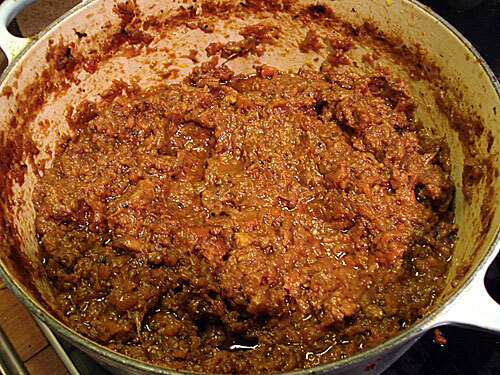 I too have been trying to perfect my bolognese recipe for years now, and have also been inspired by Heston Blumenthal's recipe. I noticed you mentioned that you did not like the addition of star anise in Heston's Blumenthal's recipe. Used in a muslin bag during the caramelisation of the onions in the sauce and the tomato compote, it was a revelation to me when i first discovered it, and i find your opinion surprising! Apparently when combined with the caramelised onions, it produces a compound which enhances the meaty flavours; something which i found to be spot on. Other than that, we have pretty similar views on the perfect bolognese! I think this recipe is amazing and though I only used beef this time as that is all I had in to hand, I shall try it with other meats! To the anonomous quote from before, I believe that as our knowledge of food and ingrediants develops it therefore follows that recipe's will change and improve! What is wrong with that! Thanks for the detailed instructions. I will have to give your spaghetti bolognese recipe a try and compare it the one featured at Cookinghow. I do prefer to ground my own meat. Not too sure about the nutmeg, but I will give it a try! Well I made this and it was strange, very strange. However the solution was by way of adjusting the herbs was to miss out the rosemary and the result, a fabulous although very rich bolognese. steak mince,a little beef extract, oxo is fine ,one cube mixed with a little boiling water,Chopped onions,mushrooms,green peppers. fresh herbs (basil thyme rosemary oregano) canned chopped tomatoes, loads and loads of tomato puree,at least a tube! This looks awesome...going to make it this weekend. Agreed on the long cooking time. Also on the cheaper cut of meats. I make a pork sugo http://www.noreciperequired.com/recipe/pork-sugo that goes hours and hours. I think the real difference is in the sugo I use just a touch of tomato, so it's even more a "meat" sauce. Great recipe! !